Pours a nice copper with reddish orange hues with an off white head. Well the nose is spicy for sure but there is an odd grainy or cereal smell also. There also may be a little hop presence but it’s having a hard time getting though those grainy cereal smells. This is just a bad tasting beer, pumpkin or no pumpkin. I’ll try to go on but I don’t think it’s going to get any better. I am having this beer just after I had the Wolaver's Will Stevens' Pumpkin Ale. So to be fair I’ll eat some crackers and see if I can cleanse the palate and come back to this beer. Well that didn’t work. It’s not the worst beer I’ve had but it’s not good either. It tastes more like a lager then an ale. The regular Michelob lager may actually taste better then this. The flavors are artificial and they muddle together to one awful taste. OK awful may be harsh but not good for sure. 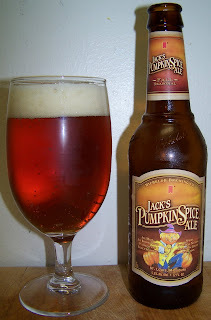 I know now what pumpkin ale is on the bottom of my list so far this year and its Jacks. I do not under any circumstances recommend this beer. It’s just not good.